When I was in the US recently I came across a pop-over pan in William-Sonoma, which is one of my favourite kitchen shops to browse for inspiration and getting the occasional treats. 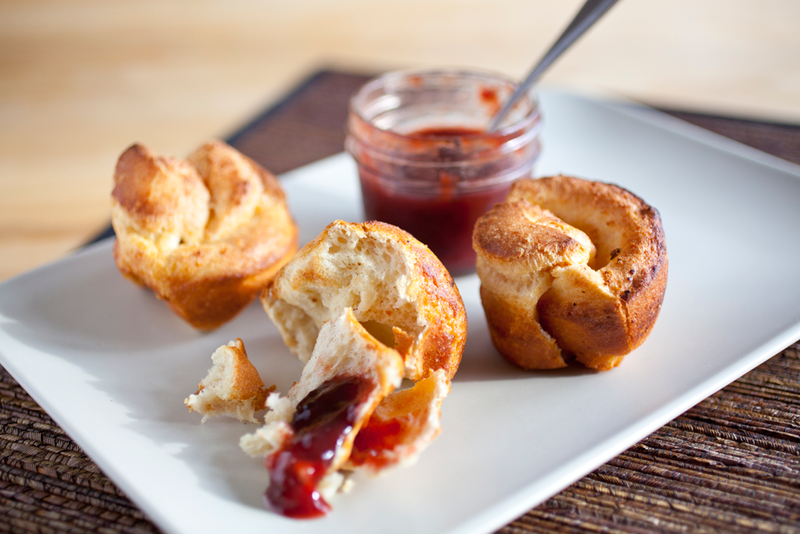 I didn’t know what pop-overs were but when I looked up the receipe for them I realized they are pretty much what we call a Yorkshire Pudding here in Britain – and here, these are eaten with a Sunday Roast, as part of a savoury meal. And as they are possibly my favourite part of a traditional Sunday Roast I got very excited when I realized there’s a way I could eat them as a (sweet) breakfast too! I had to try them out and think they make a great start to the day, eaten with a fruit jam that is not too sweet. I had a delicious spiced plum jam from a lovely bakery and deli called Mabel’s in Toronto that worked a treat and would think Apricot jam would work equally well. I never actually bought the pop-over pan as I thought I would try making them in a muffin tin instead and they came out just fine. Preheat an oven to 450°F / 230°C. Melt the butter for a few (!) seconds in the microwave and leave the melted butter aside for a moment. Mix the flour and salt in a bowl and make a well in the centre of it. Whisk the eggs together with the milk in a jug and pour the mixture into the well. Whisk until combined and pour everything back in your jug. Place the muffin tin in the oven for it to heat up for around 2 minutes. Take it out of the oven and spoon a teaspoon of the melted butter into each muffin cup. Pour the batter evenly divided into the cups, filling them half full. Bake for 10 minutes, then reduce the heat to 375°F / 190°C and bake them for a further 20-25 minutes until the popovers are golden and crispy. Take the pop-overs out of their cups immediately and serve warm. This entry was posted in Other and tagged alternative, autumnal, breakfast, brunch, delicious, delight, dish, dutch pancake, easy, easy recipe, eggs, oven bake, pretty, quick recipe, recipe, spiced, super easy, sweet, tasty, treat, Yorkshire Pudding, Yorskire Puddings. Bookmark the permalink.